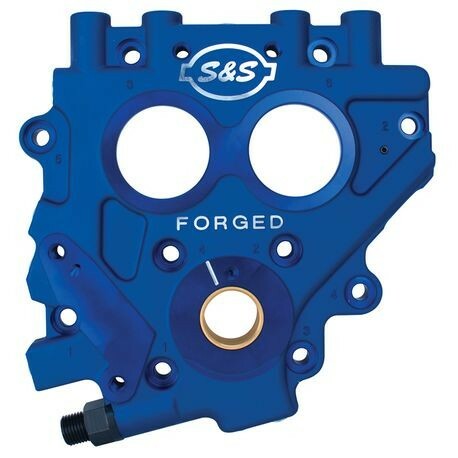 S&S cam support plates are just what the doctor ordered when repairing a damaged engine or installing new camshafts. CNC machined from forged aluminum for excellent strength and dimensional accuracy. S&S cam support plates fit 1999-2006 Harley-Davidson® big twin engines. We don’t want to encourage bad habits so plates for 1999-2006 are not compatible with stock spring-loaded chain tensioners, and require late style hydraulic tensioners and oil pump. We suggest the new S&S oil pumps and chain tensioners be installed with new cam support plates. Installed the plate summer 18. Just pulled it back out to install 583 easy start cams! So glad i went hydraulic by S&S! Not compatible with stock spring-loaded chain tensioners or stock 1999-2006 oil pumps. A 2007-later style oil pump is required for all applications. 2007-later style hydraulic tensioners are required for chain drive cams.